Parkinson's disease, a prevalent neurodegenerative disease, is characterized by the reduction of dopaminergic neurons resulting in the loss of motor control, resting tremor, the formation of neuronal inclusions and ultimately premature death. Two inherited forms of PD have been linked to mutations in the α-synuclein and parkin genes. The parkin protein functions as an ubiquitin ligase targeting specific proteins for degradation. Expression of human α-synuclein in Drosophila neurons recapitulates the loss of motor control, the development of neuronal inclusions, degeneration of dopaminergic neurons and the ommatidial array to provide an excellent genetic model of PD. To investigate the role of parkin, we have generated transgenic Drosophila that conditionally express parkin under the control of the yeast UAS enhancer. While expression of parkin has little consequence, co-expression of parkin with α-synuclein in the dopaminergic neurons suppresses the α-synuclein-induced premature loss of climbing ability. In addition directed expression of parkin in the eye counteracts the α-synuclein-induced degeneration of the ommatidial array. These results show that parkin suppresses the PD-like symptoms observed in the α-synuclein-dependent Drosophila model of PD. The highly conserved parkin E3 ubiquitin ligase can suppress the damaging effects of human α-synuclein. These results are consistent with a role for parkin in targeting α-synuclein to the proteasome. If this relationship is conserved in humans, this suggests that up-regulation of parkin should suppress α-synucleinopathic PD. The development of therapies that regulate parkin activity may be crucial in the treatment of PD. Parkinson's disease (PD) is a neurodegenerative disorder that is characterized by muscle tremors in stationary limbs, bradykinesia (slowed movement) and difficulty initiating and sustaining movements, and affects 1–2% of the population older than sixty years of age [1–5]. As the disease progresses, both the sense of balance and the memory of the affected individual deteriorate. Post-mortem analysis reveals the selective loss of dopaminergic neurons from the substantia nigra region of the brain. Filamentous protein inclusions, known as Lewy bodies, are found within the neuronal cell bodies of the affected area, in most but not all PD patients . Although the majority of PD cases appear to be sporadic, about 5–15% have been determined to have an inherited basis [6, 7]. Recently, mutations in a number of genes have been identified as causes of PD and many of these genes are associated with the ubiquitin/proteasome protein degradation pathway. Mutations in the gene encoding the α-synuclein protein lead to the development of Autosomal Dominant PD (ADPD) [8, 9]. The α-synuclein protein is an abundant 140 amino acid, cytosolic protein found at the pre-synaptic region of neurons [10, 11]. α-synuclein appears to be involved in the biosynthesis of dopamine [12, 13]. Mutations in the α-synuclein gene [8, 9] may lead to enhanced oligomerization and fibril formation of the α-synuclein protein [14–16]. Autosomal Recessive Juvenile Parkinson's disease (ARJP), another inherited form of PD, has been attributed to a number of point mutations and deletions of the parkin gene [17–19]. ARJP is specifically characterized by a very early age of onset, mostly before forty years of age, and the absence of Lewy bodies [20–22]. In humans, the parkin gene encodes a 465 amino acid protein  that functions as one of a number of E3 ubiquitin protein ligases, components of the ubiquitin/proteasome degradation pathway . Ubiquitin protein ligases act to identify damaged, misfolded, and short-lived proteins to mediate the ubiquitination (the sequential attachment of a number of ubiquitin monomers) of these proteins, which are targeted to the proteasome [24, 25]. Experiments in tissue culture have demonstrated that parkin can ubiquitinate a number of substrates including a glycosylated form of α-synuclein , the Pael receptor , CDCrel-1 , the α-synuclein-binding protein synphilin-1 , and parkin itself [28, 30]. The loss of parkin may lead to an accumulation of one or a number of proteins in sufficient quantities to cause neuronal cell death. The interaction of parkin with α-synuclein suggests a common mechanism underlying inherited forms of PD. Indeed, elevated expression of parkin protects neuronal explants from the toxicity associated with expression of α-synuclein [26, 31]. The disease inducing-forms of α-synuclein may prevent its degradation and result in toxic accumulation. In ARJP, functional parkin protein is lost along with the ability to mediate the ubiquitination of glycosylated α-synuclein and may lead to the accumulation of this protein . Our working hypothesis is that aspects of parkin-mediated protein degradation are compromised in PD. The first Drosophila melanogaster model of PD was generated by the conditional expression of human α-synuclein in transgenic Drosophila . Flies that express α-synuclein, in either a pan-neural or dopaminergic neuron specific manner, show a marked age-dependent loss of dorsal-medial dopaminergic neurons. Cytoplasmic inclusions were observed in α-synuclein-expressing flies approximately 20 days after eclosion. While control flies exhibit a strong negative geotaxis, these transgenic flies prematurely lose their climbing ability. In addition, expression of α-synuclein in the developing eye results in precocious degeneration of the retina. In this model expression of a number of genes are dysregulated prior to the onset of neurodegeneration . These features recapitulate the main behavioural and pathological phenotypes of PD and provide an excellent model system to study the biological basis of the disease. The Drosophila α-synuclein based model has been used to investigate a number of aspects of PD. Pharmacological agents, such as the dopamine precursor levodopa, dopamine receptor agonists (bromocriptine, pergolide and SK&F38393), and the anticholinergic atropine, were demonstrated to modify the age-dependent loss of climbing ability . Co-expression of the molecular chaperone HSP70 gene with α-synuclein prevented dopaminergic neuronal degeneration . Interference with endogenous chaperone activity accelerated the toxicity of α-synuclein demonstrating a role for chaperones in the pathology of the disease. Suppression of HSP90, a negative regulator of the heat shock factor 1, by feeding flies geldanamycin prevents dopaminergic neuronal cell death . Recently, the expression of human parkin has been shown to suppress the loss of dopaminergic neurons induced by α-synuclein in Drosophila . This model has proven to be an effective tool in the investigation of the biological basis of PD. To investigate the role of parkin in the α-synuclein-based model of Parkinson's disease in Drosophila, we have characterized and expressed the Drosophila homologue of parkin in this model. Our results demonstrate that parkin can counteract the effects of α-synuclein on climbing activity and retinal degeneration. The Drosophila melanogaster parkin homologue was identified through a search of the Berkeley Drosophila Genome Project (BDGP) utilizing the tBlastn search algorithm. The parkin gene is located on the left arm of the third chromosome, in the polytene chromosome section 78C within the genomic scaffolding region AE003593 (BDGP), and consists of 6 exons over 2.2 kb (Figure 1A). A search of the genome for additional parkin homologues revealed none. Our analysis confirmed the sequence of parkin to be identical to that reported by the BDGP (AY058754.1). Two potential initiation codons for the parkin protein are separated by 42 base pairs at the 5' region of the transcript. As the second potential start codon is preceded by CAAA, a match to the Drosophila Kozak consensus sequence (C/A)AA(A/C)ATG) of translation initiation , we have assigned this as the most likely start codon. Furthermore, of the preceding fourteen potential codons only two use preferred codons  (data not shown). The Drosophila parkin gene was reported by Greene and colleagues , while the current experiments were being conducted. Dipteran and mammalian parkin proteins are well conserved. (A) Schematic representation of the Drosophila melanogaster parkin transcription unit and its location in the genomic scaffolding region AE003593. (B) ClustalW alignment of the Drosophila melanogaster parkin with homologues from Anopheles gambiae, Rattus norvegicus, Mus musculus and Homo sapiens. Highlighted are the Ubiquitin-like Domain (UBL) (green box); the Unique Parkin Domain (UPD) (red box); RING1 and RING2 (blue boxes); In-Between Ring Domain (IRB) (black box). "*" and red lettering indicates amino acids that are identical in all sequences in the alignment. ":" and green lettering indicates conserved substitutions. "." and blue lettering indicates semi-conserved substitutions. The Drosophila melanogaster parkin protein has been reported to be 42% identical to human parkin  (Figure 1B). Parkin protein homologues were identified from Rattus norvegicus (NM_020093.1) and Mus musculus (AB019558.1) via the tblastn algorithm of the National Center for Biotechnology Information (NCBI). Both the R. norvegicus and M. musculus homologues were found to have 44% identity and 60% similarity to D. melanogaster parkin when analysed by the blast2 algorithm (Figure 1B). In addition, we have determined that the Anopheles gambiae sequence XM316606.1  is a homologue of parkin. Like D. melanogaster, the A. gambiae transcript has two potential in-frame translation start sites. The Kozak sequence prior to the first ATG is very poor, however the second site closely resembles the consensus sequence and therefore it is very likely the start site. We determined that the theoretical A. gambiae parkin protein has 65% identity and 79% similarity to D. melanogaster parkin (Figure 1B). The parkin protein appears to be highly conserved at the amino acid sequence level. Alignment of D. melanogaster parkin protein sequences with the A. gambiae, R. norvegicus, M. musculus and H. sapiens homologues reveals conservation of the protein throughout a number of characteristic domains, including the Ubiquitin- like Domain (UBL), the Unique Parkin Domain (UPD), the Really Interesting New Gene finger 1 (RING1) domain, the In- Between Ring (IBR) domain, and the RING2 domain (Figure 1B). In the amino-terminal region of the proteins, the first 15 amino acids are well conserved between A. gambiae and D. melanogaster, but absent in the mammalian proteins. The human UBL shows very high similarity (62%) to human ubiquitin . Correspondingly the Drosophila UBL (Figure 1B, green box) was found to have 43% identity and 67% similarity to Drosophila ubiquitin (AAA29007; data not shown). The second highly conserved region is unique to parkin and has been termed the unique parkin domain (UPD)  (Figure 1B, red box). D. melanogaster and A. gambiae share a similar eight amino acid insertion in the UPD (Figure 1B). There are two RING-finger domains that are defined by the consensus sequence C-X2-C-X9...39-C-X1...3-H-X2...3-C/H-X2-C-X4...48-C-X2-C where X can be any amino acid (Figure 1B, blue boxes) . These RING-finger domains flank a cysteine-rich domain designated the In-Between Ring (IBR) domain (Figure 1B, black box) . These three domains are responsible for binding to specific E2 ubiquitin conjugating enzymes [23, 28, 30]. Between the RING1 and the IBR domains there is an eighteen amino acid stretch of high conservation with the sequence (N/H)S(L/F)I(K/E)(E/D)(I/L)HHF(K/R)(L/I)LX(R/E)E(E/Q)Y. A 41 amino acid segment separates the IBR and RING2 domains, and while the first half of this segment is not well conserved the second half is highly conserved with the sequence AX(E/Q)ARW(D/E)XA(S/T)(N/K)X(T/A)IKX(S/T)TKP. The carboxy-terminus is well conserved and has the following sequence M(G/A)XHWF(G/D)(-/V), suggesting a possible conserved function for the tail of the protein. As parkin undergoes self-ubiquitination , conserved potential ubiquitination sites (lysine residues) were identified. There is a lysine residue that is completely conserved at K-42 of the dipterans and this corresponding residue is K-27 in mammals (Figure 1B, black arrow). The mouse and rat parkin homologues have been recently compared to Drosophila parkin , however a number of the above features were not discussed. Overall parkin appears to be highly conserved between mammalian and dipteran species suggesting conservation of function among these species. We generated stable transgenic flies that can conditionally express parkin when the UAS/Gal4 expression system is utilized . In situ hybridization was used to confirm parkin expression in transgenic Drosophila (data not shown). Expression of parkin was directed to the developing eye using the GMR-Gal4 transgene resulting in no obvious alteration of the eye (data not shown). In vitro and cell culture research suggests that parkin can prevent α-synuclein-induced toxicity [31, 47]. Expression of human α-synuclein in the Drosophila eye causes premature deterioration of the retina . To examine if parkin could prevent α-synuclein-induced degeneration, we co-expressed parkin with human α-synuclein in the developing eye. 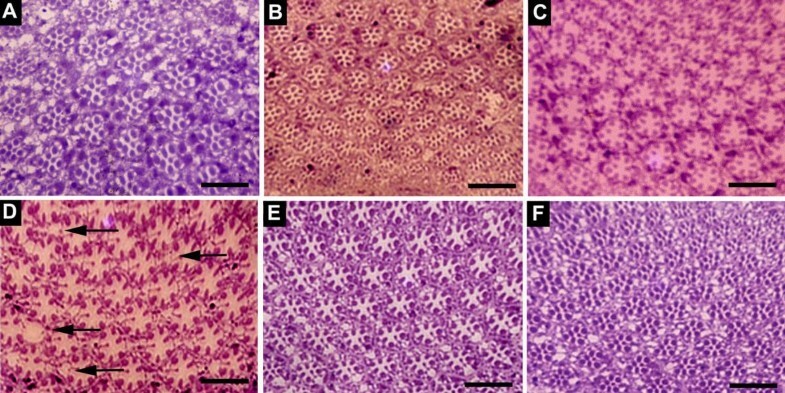 Cross-sections of the retinas of one-day-old flies that express α-synuclein appear to be intact, as previously described (Figure 2A) . The retinas of one-day-old flies that express both α-synuclein and parkin also appear normal (Figure 2B,2C). As previously described, the retinas of thirty-day-old flies that express α-synuclein show signs of premature degeneration . Degeneration of the normal architecture of the eye is apparent (Figure 2D, black arrows) and reflects the disruption of the normal placement and alignment of the photoreceptors and supporting cells. In contrast, thirty-day-old flies that express α-synuclein and parkin maintain their ommatidial arrays and morphology (Figure 2E,2F). This observation demonstrates that directed expression of parkin suppresses α-synuclein-dependent degeneration of the ommatidial array. Expression of parkin suppresses α- synuclein -induced retinal degeneration. Flies that express α-synuclein with and without parkin were aged to 1 or 30 days old. They were fixed and embedded in epon. Tangential sections (0.5 μm thick) of the retina were cut, stained with toludine blue and examined by light microscopy. Panels A-C represent one-day-old flies and panels D-F represent thirty-day-old flies. Black arrows indicate degeneration of the ommatidial architecture. The genotypes are (A,D) w1118; UAS-α-synuclein/GMR-Gal4, (B,E) w1118; UAS-α-synuclein/GMR-Gal4; UAS-parkin1.1/+, and (C,F) w1118; UAS-α-synuclein/GMR-Gal4; UAS-parkin2.1/+. Scale bar is 15 μm. Retinal damage can be observed by examining an optical effect termed the pseudopupil, which is lost in aged flies that express α-synuclein . We examined flies that co-express α-synuclein and parkin, and there appeared to be some retention of this optical effect compared with flies that express α-synuclein alone (data not shown). 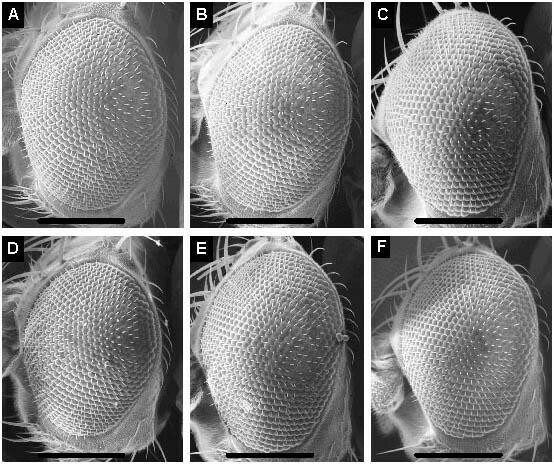 Scanning electron microscopy of eyes revealed no obvious deterioration of the surface in flies that express α-synuclein (Figure 3A and 3D) or flies that co-express α-synuclein and parkin (Figure 3B,3C,3E and 3F). Although α-synuclein causes degeneration of the ommatidial array, the external structure of the eye is unaffected. Expression of α- synuclein with and without parkin does not affect the external morphology of the eye. Scanning electron microscopy of flies that express α-synuclein with and without parkin shows no change in their external morphology over thirty days. Panels A-C represent one-day-old flies and panels D-F represent thirty-day-old flies. The genotypes are (A,D) w1118; UAS-α-synuclein/GMR-Gal4, (B,E) w1118; UAS-α-synuclein/GMR-Gal4; UAS-parkin1.1/+, and (C,F) w1118; UAS-α-synuclein/GMR-Gal4; UAS-parkin2.1/+. Scale bar indicates 200 μm. Young wild-type adult Drosophila exhibit a strong negative geotaxis, which is increased by mechanical stimulation [48, 49]. In order to measure climbing ability, flies are placed in a vial, gently tapped to the bottom and allowed to climb up the sides . When parkin is expressed in the dopaminergic neurons, these flies do not show any change in their climbing ability over their life span when compared with controls (Figure 4A). In addition, expression of parkin in dopaminergic neurons does not alter life span (Figure 4B). These results demonstrate that parkin expression in the dopaminergic neurons has little effect upon climbing ability or life span. Expression of parkin does not affect climbing ability or life span. Panel A – Climbing ability of flies that express parkin does not differ from control flies. Genotypes are w1118; UAS-parkin1.1/Ddc-Gal4 (green open triangle), w1118; UAS-parkin2.1/Ddc-Gal4 (orange open square) and w1118; Ddc-Gal4/+ (black open circles). The error bars show the standard error of the mean of twenty trials at each point. Please note that the error bars are mostly within the symbols. B – The life span of flies that express parkin does not differ from the control. The genotypes are marked the same as in panel A. The mortality of flies was examined every two days. 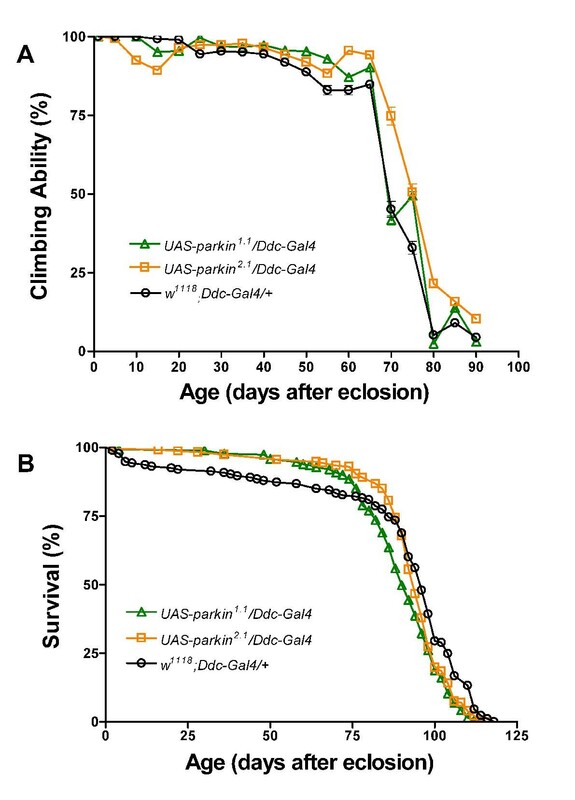 Flies that express α-synuclein, specifically in their dopaminergic neurons through the activity of the Ddc-Gal4 transgene, were assayed for their climbing ability over their life span, and were found to prematurely lose their climbing ability (Figure 5A). 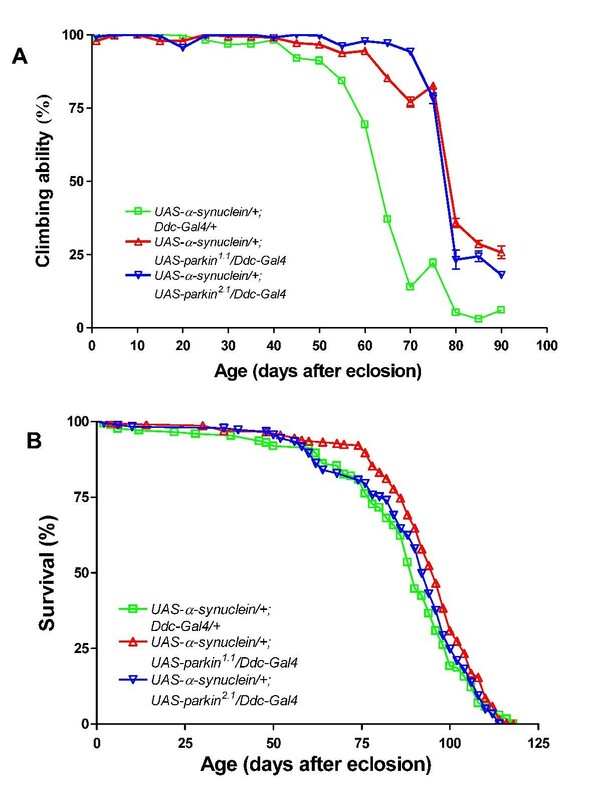 Co-expression of parkin with α-synuclein suppresses this premature loss of climbing ability (Figure 5A). This suggests that parkin can act to prevent the deleterious effects of α-synuclein expression. Expression of parkin suppresses α- synuclein -induced loss of climbing ability. Panel A – Aged flies that express parkin and α-synuclein climb significantly better than flies that express α-synuclein (P < 0.001, one-way analysis of variance with supplementary Newman-Keuls test). Genotypes are w1118; UAS-α-synuclein/+; Ddc-Gal4/+ (green open square), w1118; UAS-α-synuclein/+; UAS-parkin1.1/Ddc-Gal4 (red open triangle), w1118; UAS-α-synuclein/+; UAS-parkin2.1/Ddc-Gal4 (blue upside down open triangle). The error bars show the standard error of the mean of twenty trials at each point. Please note that the error bars are mostly within the symbols. B – The life span of flies that express α-synuclein with and without parkin does not differ. The genotypes are marked the same as in panel A. Aging assays were carried out in tandem with the climbing assays described above in order to account for changes in climbing ability as a result of premature senescence. Median survival age for flies that express α-synuclein is similar to flies that co-express α-synuclein with parkin (Figure 5B). This indicates that differences in climbing ability were not due to differences in life span. Drosophila parkin has a high degree of similarity to the mammalian and A. gambiae homologues. The five characteristic domains of the parkin protein, the Ubiquitin- like Domain (UBL), Unique Parkin Domain (UPD), Really Interesting New Gene finger 1 (RING1) domain, In- Between Ring (IBR) domain and RING2 all show a high degree of similarity. In addition, the two dipterans, D. melanogaster and A. gambiae, have a highly conserved extra segment of 15 amino acids at the amino-terminal of the protein. The regions between the three carboxy-terminus domains are also highly conserved, which may indicate conservation of function. Patients with ARJP caused by mutations in the UBL domain exhibit signs of lost substrate binding . The UBL domain also appears to be involved in binding the Rpn10 subunit of the 26S proteasome as the R42P amino acid substitution in this domain was identified in ARJP patients and results in impaired proteasome binding of parkin (Figure 6) . Alterations of the RING1, RING2 and IBR domains of parkin result in an almost complete loss of ubiquitin conjugating enzyme H7 (UbcH7)-binding activity, which indicates that all three domains are functionally important in recruiting specific E2 ubiquitin conjugating enzymes . The RING1 and RING2 domains are thought to collaborate to trap UbcH7 (Figure 6) . Amino acid substitutions in the RING1 domain change the subcellular localization of parkin and enhance cytoplasmic and nuclear inclusions . In addition, the amino acid substitutions C289G and C418R, which replace conserved cysteine residues in the RING domains, significantly decrease the solubility of parkin in cells . Ubiquitination generally occurs near the amino-terminus of proteins and ubiquitin monomers are attached to lysine residues . Several lysine residues are absolutely conserved, including one in the UBL and two in the UPD, and these may be targets for ubiquitination. The existence of orthologues of mammalian parkin in invertebrates but not plants nor fungi  suggest an animal specific function for parkin activity. The highly conserved protein domains and sub-domains suggest the probable conservation of each domain's function, and given the high degree of similarity we suggest that the function of the Drosophila parkin protein is similar to that of the human parkin protein. Model of parkin directed ubiquitination of α-synuclein. The parkin protein consists of two functionally distinct regions. The UBL/UPD region binds target proteins such as glycosylated α-synuclein. The RING-box (RING1-IBR-RING2) region recruits specific E2 ubiquitin conjugating enzymes, which add ubiquitin monomers to the target protein. In addition to substrate binding the UBL domain interacts with the proteasome. Ubiquitin tagged α-synuclein is directed to the proteasome and degraded into polypeptides and ubiquitin monomers. 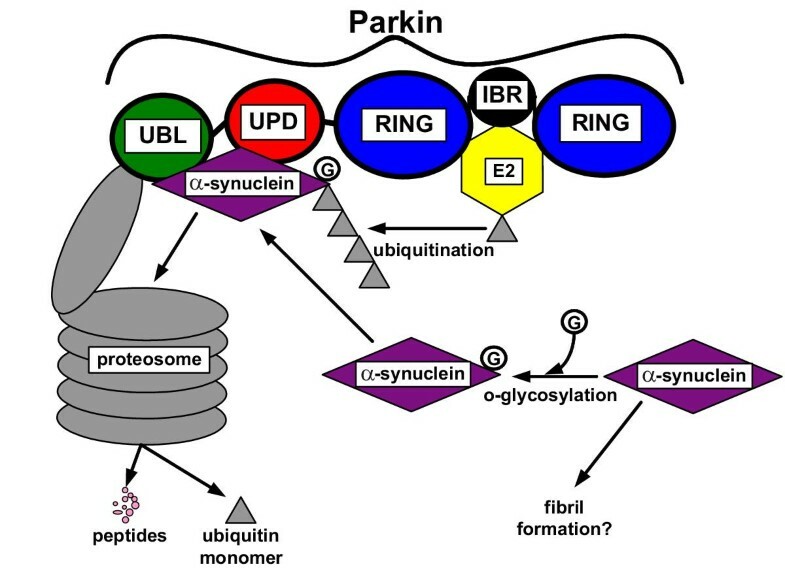 UBL – Ubiquitin-like Domain, UPD – Unique Parkin Domain, RING1 or 2 – Really Interesting New Gene finger 1 or 2 domain, IBR – In-Between Ring domain. We demonstrate that the directed expression of parkin in the dopaminergic neurons and developing eyes leads to no obvious adverse effects. The unaltered phenotype observed when parkin is expressed in dopaminergic neurons is likely due to substrate specificity and to the ability of the parkin protein to target itself for degradation . Under conditions of over-expression, parkin does not seem to target and tag essential proteins for degradation promiscuously. This may represent an excellent fail-safe mechanism the cell has developed to balance the levels of both parkin and its substrates. The Drosophila model of ADPD has been used to examine the effect of various pharmacological agents [34, 36] and other genetic aspects of the disease [35, 37]. We expressed parkin along with α-synuclein and found the suppression of α-synuclein-induced retinal degeneration and premature loss of climbing. These results indicate that parkin may target α-synuclein for degradation in vivo (Figure 6). Although coimmuno-precipitation studies have shown that parkin does not interact with or ubiquitinate non-modified α-synuclein , parkin will ubiquitinate O-glycosylated α-synuclein . Since we show suppression of the α-synuclein-induced phenotype, we believe that ectopically expressed α-synuclein is modified in Drosophila, enabling its ubiquitination by parkin. The modification of α-synuclein and subsequent ubiquitination by parkin is presented in Figure 6. In order to select rational potential therapeutic agents, the molecular mechanisms behind disease progression must be characterized. Gene function studies with homologues of disease-causing genes in model organisms have been made practical through the advent of genome projects. Over-expression of parkin has no apparent adverse consequences and it suppresses the α-synuclein-induced PD symptoms in Drosophila. If this relationship is conserved in humans, we suggest that up-regulation of parkin should be a viable treatment for PD, and the selection of therapeutic strategies should be directed towards this end. Our experiments demonstrate that the directed expression of the parkin gene counteracts the PD-like symptoms in the α-synuclein-induced Drosophila model of PD. Manipulation of the ubiquitin/proteasome degradation pathway in such a specific manner apparently remedies the toxic accumulation of α-synuclein. This study demonstrates the success of selective targeting of toxic proteins for degradation as an approach to address neurodegenerative conditions such as Parkinson's disease. The development of therapies that regulate parkin expression or parkin protein activity may be crucial in the treatment of PD. The Drosophila melanogaster homologue of parkin was identified through a search of the Berkeley Drosophila Genome Project  queried with the human parkin amino acid sequence, AB009973.1. A clone of the Drosophila parkin cDNA (SD01679) was obtained from Research Genetics , sub-cloned and sequenced (Cortec DNA Service Laboratories Inc., Kingston, ON, Canada). The intron/exon map was constructed by comparison of the cDNA to the corresponding genomic region. Other homologues of parkin were identified with the tblastn algorithm  of the National Center for Biotechnology Information (NCBI) using the theoretical translation of SD01679 cDNA. The blast2 sequence comparison program (NCBI) was used to compare the R. norvegicus (NM_020093.1), M. musculus (AB019558.1) and A. gambiae (XM316606.1) sequences individually with the D. melanogaster parkin protein sequence . 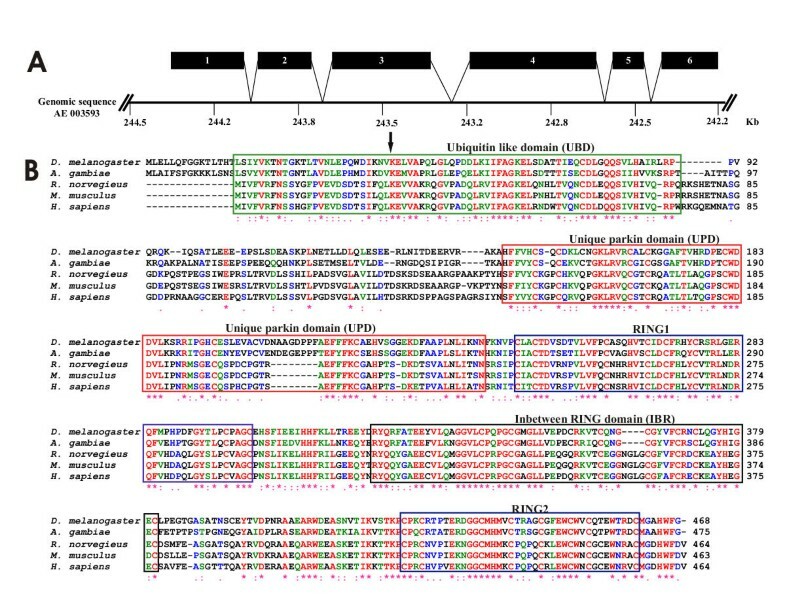 The multi-alignment of the five parkin homologues from D. melanogaster, A. gambiae, R. norvegicus, M. musculus and H. sapiens was constructed by editing the results from the multialign ClustalW program from the Pôle Bio-Informatique Lyonnaise [58, 59]. Dr. M. Feany (Harvard Medical School) and Dr. J. Hirsh (University of Virginia) generously provided UAS-α-synuclein  and Ddc-Gal44.36 flies  respectively. The GMR-Gal4 flies  were obtained from the Bloomington Drosophila Stock Center at Indiana University. A BglII/XhoI fragment containing the parkin cDNA (SD01679) was subcloned into the pUAST vector to generate the UAS-parkin transgene. Two independent transgenic lines were generated using heat shock π as a source of transposase and standard injection techniques into w1118 embryos. Double transgenic lines with UAS-α-synuclein;UAS-parkin1.1 and UAS-α-synuclein;UAS-parkin2.1 were generated using standard techniques. To drive expression of the transgenes, Ddc-Gal4 (for expression in the dopaminergic neurons) or GMR-Gal4 (for expression in the eye) homozygous females were crossed to w1118 males (control) or UAS-α-synuclein with or without UAS-parkin1.1 or UAS-parkin2.1. All flies were cultured on standard cornmeal/yeast/molasses/agar media at 25°C. Third instar larvae were dissected in PBS, fixed in 4% formaldehyde and dehydrated in methanol and ethanol. The carcases were probed with a DIG labelled anti-sense parkin RNA probe generated from a linear cut plasmid containing the entire parkin cDNA using the Roche Applied Science DIG Northern starter kit and reduced in size with carbonate buffer treatment. To visualize parkin RNA alkaline phosphatase labelled anti-DIG anti-bodies were incubated with the carcases and subjected to alkaline phosphate treatment as per the Roche Applied Science DIG application manual. The eye discs were dissected out completely and examined under light microscopy. The genotypes of the larvae examined were 1) w1118; 2) w1118; GMR-Gal4/+; UAS-parkin1.1/+; and 3) w1118; GMR-Gal4/+; UAS-parkin2.1/+ and at least ten of each genotype were examined. Adult males were collected under gaseous carbon dioxide anaesthetic and aged in small groups (~10 or less per vial) upon standard cornmeal/yeast/molasses/agar media at 25°C in upright standard plastic shell vials. The flies were scored for viability every two to three days and transferred to fresh media without anaesthesia . The numbers of individuals aged are as follows: UAS-α-synuclein/+; Ddc-Gal4/+ = 191; UAS-α-synuclein/+; UAS-parkin2.1/Ddc-Gal4 = 292; UAS-α-synuclein/+; UAS-parkin1.1/Ddc-Gal4 = 204; w1118; Ddc-Gal4/+ = 173; UAS-parkin1.1/Ddc-Gal4 = 262; and UAS-parkin2.1/Ddc-Gal4 = 227. Flies were assayed for their ability to climb as described by Feany and Bender . Every five days, forty male flies from a cohort of flies were assayed for their ability to climb six centimetres in eighteen seconds in a sterile plastic vial. Twenty trials were carried out for each time point. Data shown represent the results from flies tested over ninety days. Flies were of each genotype [1) w1118; UAS-α-synuclein/GMR-Gal4; 2) w1118; UAS-α-synuclein/GMR-Gal4; UAS-parkin1.1/+; and 3) w1118; UAS-α-synuclein/GMR-Gal4; UAS-parkin2.1/+] aged and frozen in a -70°C ethanol bath. Whole flies were mounted, desiccated overnight and coated in gold before photography at 150 times magnification with a Hitachi S-570 SEM as per standard methods. For each condition at least six flies were analysed. Adult flies [1) w1118; UAS-α-synuclein/GMR-Gal4; 2) w1118; UAS-α-synuclein/GMR-Gal4; UAS-parkin1.1/+; and 3) w1118; UAS-α-synuclein/GMR-Gal4; UAS-parkin2.1/+] were aged (one or thirty days after eclosion), fixed in Karnovsky's fixative and embedded in epon. Tangential retinal sections were prepared at a thickness of 0.5 μm and stained with toluidine blue, examined by light microscopy and photographed at magnification of 800 times. This research was funded by the Natural Sciences and Engineering Research Council of Canada and the Dean of Science of Memorial University of Newfoundland (start-up funds) to BES. AFMH was partially funded by a Graduate Student Demonstratorship. We thank E. Lloyd Smith and Bernard Healy (Faculty of Engineering, Memorial University of Newfoundland) for design and production of the climbing assay device. We thank Lisa Lee and Roy Ficken (Department of Biology, Memorial University of Newfoundland) for help with SEM and photography respectively, and Kate Williams and Howard Gladney (Faculty of Medicine, Memorial University of Newfoundland) for help with sectioning. We thank John P. Phillips (Department of Molecular Biology and Genetics, University of Guelph) for advice on matters of longevity. We thank Jamie Kramer for advice on in situ hybridization and Peter Earle for help with citation software. We also thank Dr. Helene Volkoff, Dr. H. Dawn Marshall, Lisa Saunders and Justin Moores for comments on the manuscript. AFMH conducted the molecular and bioinformatic analyses, genetic manipulation, transgenic generation, sample preparation, light microscopy, scanning electron microscopy, aging bioassays and behavioural experiments as well as designing the experiments and drafting the manuscript. BES initiated the bioinformatic investigation of the Drosophila parkin gene, collaborated with experimental design, participated in the creation of transgenics, edited the manuscript, as well as acting as supervisor and primary investigator.